Despite her best efforts, these kidnappers know how to handle a werewolf inexperienced in hand-to-paw combat. She regains consciousness hours after the scuffle to find her brother gone. In a panic, she turns to the only werewolf she knows: Wayne, Mr. Werewolf Pride, the guy Lindsay rejected none-too-kindly several years ago. Being the forgiving kind of guy he is, Wayne agrees to help... so long as Lindsay joins his pack. 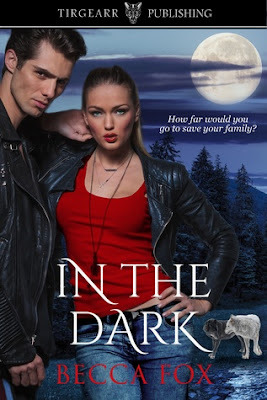 Living among others of her kind is the last thing Lindsay wants, but for her brother’s sake, she bites her tongue and agrees. In the Dark is an absolutely thrilling read. Although I would have loved to have seen this stretched into a series simply because I love Lindsey so much, it was an absolutely thrilling read with just the right mix of romantic tension. Lindsey is someone I can totally identify with - strong-willed, just wanting to make it through life like a normal person and protect her family. Fate has a different plan in store, and with lives at stake Lindsey rises to the occasion with a little help from two hot guys who both want to capture her heart. It's a compelling read and perfect for anyone who doesn't mind a little adrenaline and dirt in their romance. Please be aware this might not be totally suitable for some people, it does get a little graphic at times, so don't go in thinking this is just going to be romance with a little excitement on the side. About the Author: Becca Fox was that strange girl in high school, who always seemed to have her nose in a book. She didn’t talk much because, more often than not, she was daydreaming about different fantasy worlds. During class, under the guise of taking notes, she wrote scenes for her works in progress. Becca is a bit more social now but still enjoys reading, writing, and daydreaming. She lives in Phoenix, Arizona with her husband, a fat orange tabby cat, and a forever-puppy.